Systemic injection of the sympathomimetic agent ephedrine (EPH) stimulates locomotion in drug-naive rats, an effect that may be dependent on the enantiomer of EPH employed [(–)-EPH or (+)-EPH]. 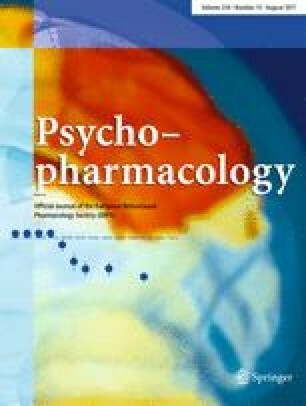 The present experiments examined the effects of repeated EPH exposure on locomotion in rats to assess whether these treatments result in drug tolerance or sensitization. In experiment 1, adult male rats were injected once daily with 0, 10, 20, or 40 mg/kg (–)-EPH (IP) on each of 11 days. Locomotor activity was assessed for 60 min after drug injection. Acute exposure to (–)-EPH treatment increased locomotion for animals receiving 20 or 40 mg/kg, and this effect was augmented after 11 days of drug administration. A vehicle-only injection was given to all animals on day 12 to determine the influence of environmental cues on sensitization. On day 13, all rats were injected with 10 mg/kg cocaine HCl to assess whether repeated (–)-EPH exposure produced a cross-sensitization to cocaine (10 mg/kg, IP). Only rats treated repeatedly with 40 mg/kg (–)-EPH exhibited increases in cocaine-stimulated locomotion relative to saline-treated rats. In experiment 2, repeated exposure to (+)-EPH, 40 mg/kg, but not 20 mg/kg, increased activity and demonstrated the development of sensitization. Cross-sensitization to cocaine (10 mg/kg, IP) was not evident following treatment with either concentration of (+)-EPH. There was no evidence that contextual events alone played a role in the effects observed here.